On Saturday last St Pats claimed the U14 B South Tipperary County championship with a two point win over their old rivals Kilsheelan in a thrilling final played on a damp day in Grangemockler.St Pats dominated the opening exchanges but clear cut scoring chances were as scarce as hens teeth. Conditions did not favour fluent hurling or a good first touch. Both defences were on top in the opening first ten minutes, first blood went to Kilsheelan with a goal around the midway point of the first half. Our first reward was a pointed free from Cathal Mahoney this was followed a short time later by a goal from Aidan Buckley after a quickly taken free by Cathal Mahoney. Kilsheelan squared the match with a pointed free just before halftime. We opened the second half in fine form and went ahead with a point from Cathal Mahoney. At this stage we were in control of the match and we raised another green flag with an excellent goal from Cameron Moynihan. Around mid way through the second half Kilsheelan hit a purple patch and hit five points without reply, putting them into a one point lead with the clock heading towards full time. It was at this time that we showed our true character, with our backs to the wall and under serious pressure we brought our A game to the party. Working the ball up field we were rewarded with the defining score of the match, a goal by super sub Jack Hennessy. At this stage there was still three or four minutes to play and two points is a very dangerous lead. For these remaining minutes (which lasted an eternity) our lads put on a master class in defending to ensure out line was never breached. At the final whistle there was a joyous celebration for a well merited victory in a pulsating game that was in the balance until the final whistle. Captain Conor Cuddihy was presented with the cup by South Bord na nOg chairman Martin Cody to rapturous applause. There were a few outstanding individual performances on the day, but victory was built mainly on a great team performance, where every member of the panel contributed 100%. They never let their heads drop even when things were going against them especially towards the end of the second half. With a good work ethic and a never say die attitude we look forward to seeing this team play in the A grade at U16 in two years time. Playing at the top level should enhance their development and ensure we have good players coming through in future years. This is just reward for this group of players who have worked very hard over the years winning a couple of U10 championships and just coming up short in the U12 two years ago. Well done to Philly Keane Kevin Boland and Siobhan Vaughan for all the hard work during the year. 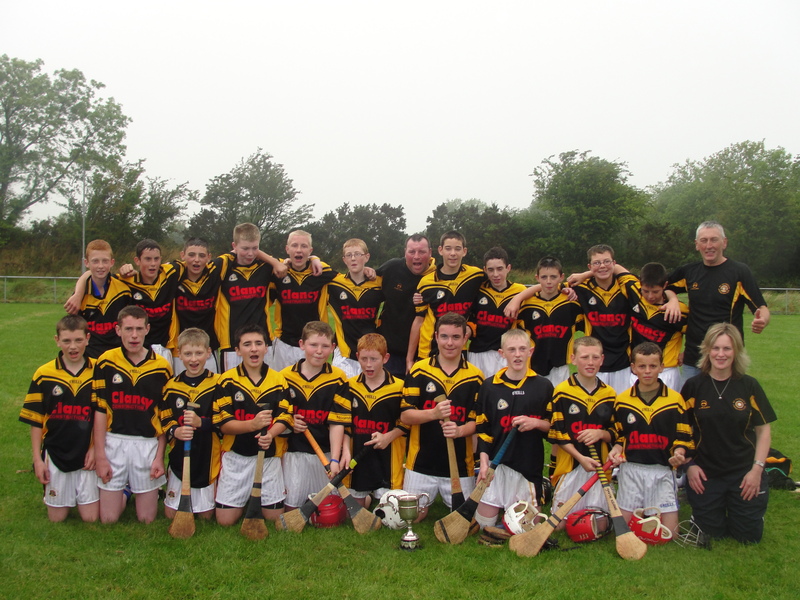 We now look forward to playing Gortnahoe in the County semi final. This entry was posted on September 8, 2010 at 6:30 pm and is filed under Hurling. You can follow any responses to this entry through the RSS 2.0 feed. You can leave a response, or trackback from your own site.